"He who observes spills no less blood than he who inflicts the blow." Lionsgate has debuted a trailer for The Limehouse Golem, a new gothic horror film that premiered at the Toronto and Sitges Film Festivals last year. Bill Nighy stars a London detective investigating the mysterious case of the "Limehouse Golem", a meticulous serial killer haunting the streets of Victorian London. The cast includes Olivia Cooke, Sam Reid, Douglas Booth, Eddie Marsan, Daniel Mays, Maria Valverde, and Morgan Watkins. I do remember hearing some good things out of the film festivals last year, and this certainly looks interesting. There's obviously some twists and turns, hopefully, and it seems like a chilling gothic thriller the likes of Sherlock Holmes meets Jack the Ripper. This may be a perfect film for October, or anytime for horror fans. Set on streets of Victorian London in 1880, our tale begins in the baroque, grandiose music hall where the capital's most renowned performer Dan Leno (Douglas Booth) takes to the stage. The whimsical thespian tells of the ghastly fate of a young woman, his dear friend Elizabeth Cree (Olivia Cooke); for the beguiling songstress is facing up to her forthcoming death by hanging, having been accused of murdering her husband John Cree (Sam Reid). 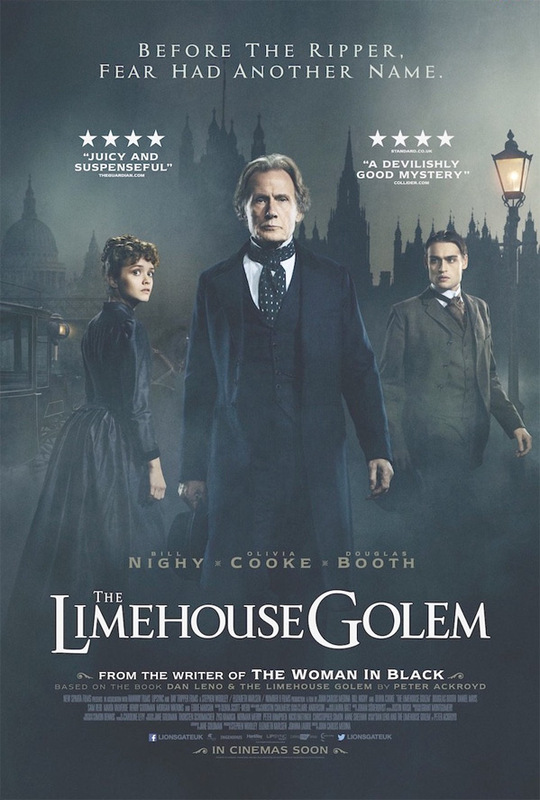 Lizzie's death seems inevitable, until Detective Inspector John Kildare (Bill Nighy) is assigned to the case of the Limehouse Golem -- a nefarious, calculating serial killer, murdering innocent, unconnected victims, leaving behind barely identifiable corpses – and his distinctive signature in blood. All is not what it seems and everyone is a suspect and everyone has a secret. The Limehouse Golem is directed by filmmaker Juan Carlos Medina, of the film Painless previously. The screenplay is written by Jane Goldman, based on the novel by Peter Ackroyd. This first premiered at the Toronto Film Festival last year. Lionsgate will release The Limehouse Golem in UK theaters in September. No US release is set yet.